Apparently now it's 1-2% chance, so farming on 10m is the only way to really obtain the mount at 85. 25m probably has the same chance to drop, except it drops Reins of the Azure Drake. I just received this mount out of Satchel of Exotic Mysteries from a Tank queue. It is the first time I received anything other than gold and flasks! I get the achievement You Don't Have an Eternity (10 player) and the Reins of the Blue Drake dropped. 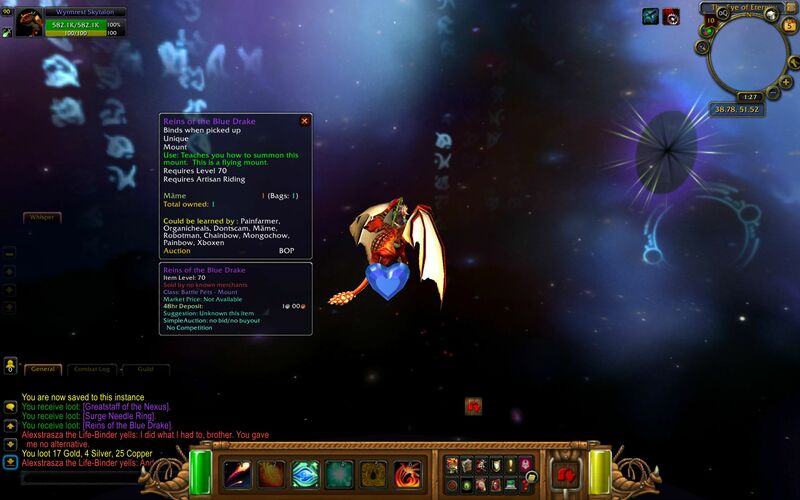 out of 10653) The Eye of Eternity, and 4.32% on 10-player (1591 out of 36824) The Eye of Eternity, according to Wowhead. out of 10653) The Eye of Eternity, and 3.79% on 10-player (1394 out of 36824) The Eye of Eternity, according to Wowhead. The current normal and heroic raid settings don't apply to The Eye of Eternity; the Legacy Raid Size settings of 10-player and 25-player (which used to be called normal and heroic) select which version you'll enter. The Legacy Raid Size setting is found by right-clicking on your character's portrait, and hovering over Raid Difficulty. It can only be changed when you (or your party/raid, if in a group) are outside of the instance. A message is displayed in the chat window confirming the size of the raid when you zone in. 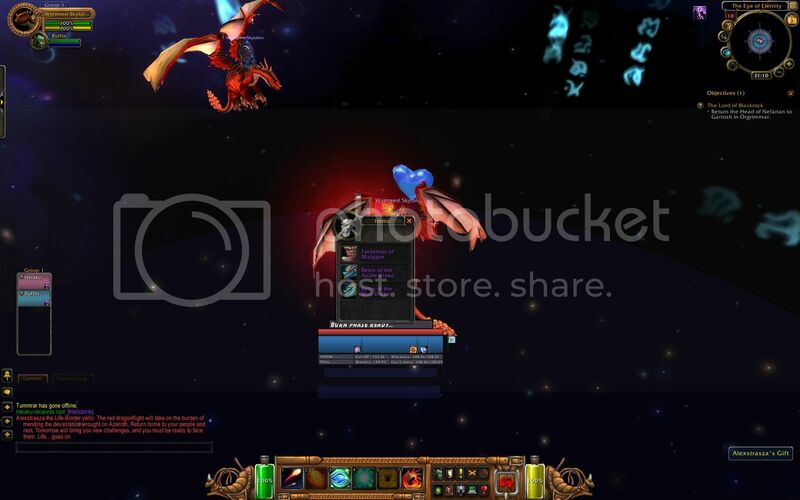 The Eye of Eternity is a one-boss raid that's easy to solo at level 100+: click the orb in the center of the platform to start the encounter, damage the dragon Malygos until she's down to 1 health (she flies in the air as she gets low; use ranged attacks until she's at 1 health or becomes untargetable), then kill all the Nexus Lords on flying Hover Disks that appear (if you're melee, they'll eventually come down to you, and after you kill one you can click on his Hover Disk to fly around and kill the others), then wait for the platform to disintegrate and drop you onto a drake, fly up a couple yards and turn around toward the dragon, wait a few seconds until you can target her, then press the buttons 1, 1, 2, 1, 1, 2, repeating, sometimes moving around her to move out of lightning sparks, until she's dead. (If she was down to 1 health earlier, the first "1" key should finish her off). If you've targeted her but the 1 key isn't hitting her, you're probably too near, or too far, or didn't actually click to target her...the sweet spot is maybe 20-30 yards away. After killing her, fly toward the blue crystalline heart (Alexstrasza's Gift), wait until it's clickable, then click it for your loot. After that, look for a portal 10 or 20 yards away, fly toward that, and click it to exit the instance. If you get hopelessly lost trying to find the portal (we were all noobs once), you can always press escape, click the Help button, click the Character Stuck! button, and choose Teleport to Graveyard. 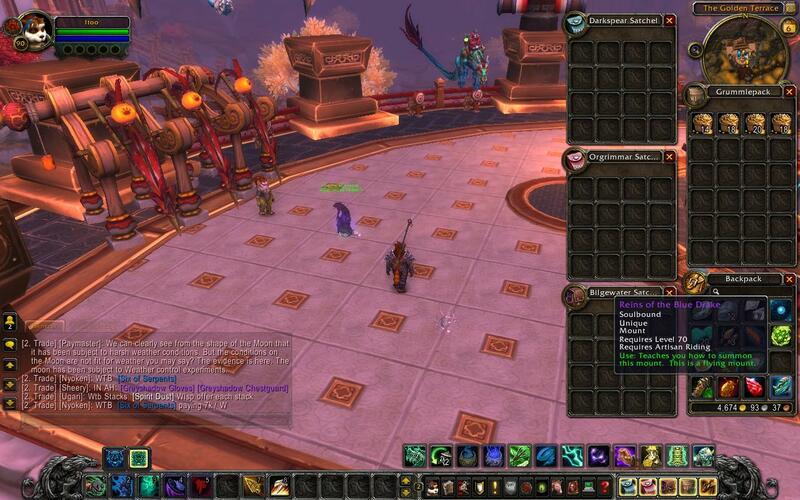 The Black Market Auction House has a rare chance to list both the Blue and Azure Drakes (typical prices are currently 50,000-100,000 gold, but you never know what someone will bid), and have a rare chance to drop in the BMAH's Unclaimed Black Market Container (very little data is available, but other mounts have had estimated 2-3% drop rates from unclaimed containers). 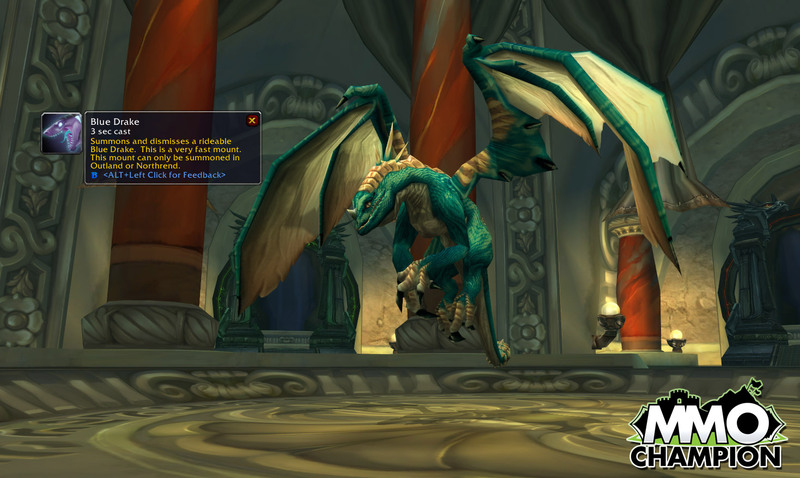 The Blue Drake (not the Azure Drake) supposedly has a 6% chance to drop from a Cache of the Ley-Guardian from The Oculus dungeon, but the cache doesn't seem to drop for level 100 players soloing it. It used to drop from Satchel of Exotic Mysteries, but that's no longer available.